John Byrne: In 1819, an English essayist named William Hazlitt said, "Man is the only animal that laughs and weeps, for man is the only animal that sees the difference between the way things are and the way they ought to be." If you think about that quotation for a minute, it's not so important whether man laughs or whether he weeps, but it is important that he have some sense as to how things ought to be. Peace. Harmony among individuals. The ability to get along without violence. All fit in that category of how things ought to be. They aren't always that way, but fortunately, there are individuals among us who devote their skills, their talents, their energy, their hopes, [and] their dreams to doing what they can to make things the way they ought to be. And we're very, very fortunate that some of those individuals are among us tonight. That's what the Ava Helen Pauling Peace Lectureship is about: to bring to us people who we can honor because they attempt to make things the way they ought to be, and who, by coming, and who, with their efforts, honor us and honor all humankind in seeing that things are the way they ought to be. And that's what peace is all about. Now, before I introduce our speaker for this evening, let me tell you a little bit about the format. Those of you who have been here for the Pauling Lectureship before will recall that we will have an address - a thoughtful address by someone of importance - someone who has something significant to say - and then we usually follow it with a period of questions. Tonight, our format will be a little bit different because of the coincidence of the Pauling Lectureship with the Military-Industrial Complex Symposium focusing on Eisenhower's warning thirty years later. And so, tonight, when our guest speaker completes his address, we have asked one of the participants in that industrial-military complex symposium to respond, and I have been told [he will take] no more than ten minutes in the response - a little signal there. That signal is to Seymour Melman, who I will introduce later when he responds to the comments by Johan Galtung. Now, most of you should have received, as you came in, the program for this evening, and I could read to you the things that it says about Johan Galtung, and we could read them aloud together, and so on, and thereby reinforce what we really want to know about this man before he speaks to us. He is the Professor of Conflict and Peace Research at the University of Oslo. He is Director General of the Inter-University Center of Post-Graduate Studies in Dubrovnik, Yugoslavia, and President of the World Futures Studies Federation. And if you were looking, you were probably reading along with me as I read that. But I would like to tell you some other things that you can't read about this person. First of all, he has a rather prodigious list of publications. Someone has said over a thousand articles and more than 44 books, and someone else said to me, "His vita would warm the heart of any dean" - strike that and write, "provost." But that's not important. That's a reflection that we have a creative man - a man of thought, a man of consideration, a man who believes and has the confidence in what he believes - and he has had a variety of interests. Now, lest you get the idea that this particular individual is someone without humor - without pizzazz - let me set that aside. He told me yesterday that he was surfing off Hawaii, and he prefers a rather flat board. And then he, somewhat facetiously, said, "Because then I can put a chair on it and put my computer in my lap and compose as I surf." He is a visiting professor of sorts, I guess - a special regular visiting professor at the University of Hawaii. But then he revealed to me that he is also a visiting professor at ten other universities in Europe, and he immediately pulled out his Eurail pass to show me how he gets around Europe. We talked a little bit about Hawaii, and he told me the things that he does. He lives close to the campus - the Manoa campus in Honolulu. [He] rides his bicycle, obviously surfs, does a little bit of snorkeling - maybe some scuba diving. 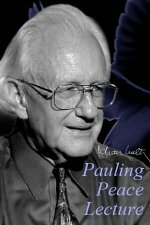 He says that [with] the lifestyle in Hawaii, it's easy to be healthy, and then he sort of whispered and he said, "It may even be as good as taking large quantities of vitamin C."
Johan Galtung: Dear Linus Pauling, dear John, dear friends. It's indeed a great honor for me to have been invited here to give the seventh Eva Helen Pauling Lecture. I would like to start by pointing to a basic similarity between Oregon and Norway. I think they're both rather decent places, often suffering from a cloud, and often being a little trifle boring, but basically peaceful. So, the question has to do with decency, boredom, and a cloud, and peacefulness, and what I shall try to do is to disperse some of the clouds in your minds by giving a theory of peace, and then try to answer the question that relates it to a U.S. political discourse. So, in other words, my topic falls into two parts: a theory of peace on the one hand, and on the other hand, a theory of U.S. political discourse, and then the relationship between them. You can say that, in outline form, I'm going to say something about [how] the tasks of peace as thirty years of peace studies, to my mind, can be outlined. I'm going to say that's difficult enough, but if, in addition, the discourse - in other words, the intellectual framework within which politics is conceived - is inadequate to the task, then it becomes even more problematic. So you may say that in doing it this way, I am not giving the U.S. luncheon address. The U.S. luncheon address starts at the high pitch of optimism, and then it goes quickly down to a problem, but it stays with the problem only three minutes, and then it comes up again to an even higher pitch of enthusiasm, where it ends. So I am more using the German style, which is that you start already low down, and then you go down from that point, and you go further and further down until you disappear, so to speak, into the ground. And that's not three minutes, but two hours. And at the end of that, the German chairperson of the meeting will say, "We have really had a nice evening together." Now, as a Norwegian, I'll try to go for a middle course. So, here I start. I see peace as regulation of power. And the President of the University just gave as good a definition [as] any. Peace is the ability to get along without violence. Now, violence and power are intimately related because power is the instrument that can be used to inflict violence. It can also be used to get along without it. I use two types of violence as the immediate expressions: direct violence, which is very simple to understand, and the structural violence that kills slowly and is built into the structure. Its language is economics and politics, and the language of direct violence is more military. I am talking now, essentially, of the relations between states - if you will, macro-peace, not the equally important and equally difficult micro-peace at the more interpersonal level. But underlying direct and structural violence there is a third type, which, to my mind, has not been sufficiently studied. I call it cultural violence, and I define cultural violence as those aspects of a culture that legitimize direct or structural violence. Let me give examples immediately. I think the most dangerous type of cultural violence is the type that defines some people as chosen peoples and others as not. The moment a people sees itself as chosen by higher forces - by God, by Providence, by Yahweh, by Allah, or by the Japanese sun goddess, Amaterasu Omikami - the moment that has happened, the line has already been drawn between that people and others, and the stage is open for an almost unlimited display of direct and structural violence. The cultural violence, then, should not be defined or conceived of as nationalism. It's not a question of having identity with one's own people. That may be beautiful - even a very positive sentiment. It's a question of seeing oneself as closer to the ultimate force in the universe - to the ultimate divinity - and of having scriptures to point to to back up that idea. Let me take an example of something that is not of that type. We know from Sri Lanka's recent history that Buddhists are quite capable of cruelty killing, but when they do that, they are not able to say that this is in the name of the Buddha. They cannot say that Buddha chose us to do exactly this. They cannot point to letter and verse. In other words, it is not cultural violence. It is simple direct violence. How would we, in the contemporary world, reduce the possibility of military violence? Well, there are many answers to this, and one of the answers - an answer that has been strongly with us since the 1920s, and also before that, actually around 1815 - is disarmament. So I am now, as a peace researcher, going to argue that that is neither necessary, nor sufficient. I think that the world, or a part of the world, with general and complete disarmament and nothing else, might be a world where rearmament would take place extremely quickly. The structure of peace is not written in negative terms only. It is written in very solid, cooperative structural terms that I am coming to, and a disarmament program alone might prove to be an enemy of peace, precisely if it were taken alone. In other words, disarmament is certainly not sufficient. Is it necessary? So, I am going to argue that it is not necessary. Switzerland is not disarmed; Finland is not disarmed; Sweden is not disarmed; Yugoslavia is not disarmed; Austria is not disarmed. And yet, I think all those five neutral countries in the center of Europe running north to south, are probably among the countries least likely of any to initiate any kind of war, and probably also least likely to be basically hurt by a war, with the exception of a major nuclear catastrophe. How come? Simply because they have a different military doctrine. And I'm then saying that military doctrine is the unit of analysis, not the military inventory. That even the formula military-industrial complex, how useful it is - and I'm coming to it immediately - does not, I think, capture the more basic aspect. Now, let us then open the Pandora's box on military doctrines. The first distinction is between aggressive and non-aggressive. An aggressive military doctrine is very honest and frank; it simply says we have these arms because we want to attack somebody - as simple as that. In those years when these were legitimate doctrines, one did not talk about the "department of defense," but such things were called "ministries of war." It was a very honest, clear declaration. And the means of destruction available were of such a kind that they could be used to attack another country. They were long distance carriers of the weapons. The idea was to bring a war on somebody else's territory. After the First World War and the horrors of that war, much of this became illegitimate, and particularly after the Second World War, "ministries of war" were renamed; they became "departments of defense." And the doctrine became a doctrine of non-aggressiveness, meaning that you have your arms, but you should never initiate a war. Then we open at that point, and we get the distinction between "offensive" and "non-offensive" doctrine. By an "offensive" doctrine, I mean a doctrine which says something like this: "We are not going to be aggressive, but we need long distance arms in order to punish the aggressor. Now, to punish the aggressor cannot be done at home; it has to be done at his place, and we want to do it before he hits us too badly." Now, this goes under several names: defensive defense, non-provocative defense, non-offensive defense. And what I then have lined out for you just a little bit, are three different military doctrines: aggressive, offensive, non-offensive. So here we have a discourse. A discourse is an intellectual framework. It lines out for you dimensions in which you can discuss - can think. Now, no discourse is perfect, and what happens throughout intellectual history is that discourses are expanded, they are rejected, they are forgotten, they are rediscovered, they are deconstructed, reconstructed - all such things happen, and what is fascinating right now is that in the whole theory of military power, this new category - defensive defense, non-offensive, non-provocative - has been added to the repertory. I say it has been added to the repertory all places in the world, almost, except the United States of America. So there I am, right in it. Why is it possible for me to do what I did two weeks ago as a council member of the Stockholm International Peace Research Institute - to have a luncheon with a field marshal of the Soviet armed forces, Akhromeyev, who has been to the States quite often, and you find the person, not only up to date, but a front thinker in the whole idea of non-offensive defense? How can we constitute our forces in such a way that we cannot attack, at the same time making it quite credible that if we are attacked, we will defend ourselves, and then go through weapons system [after] weapons system trying to find out how that can be done? And yet, what happens when I, as a peace researcher, am invited to talk at the United States Air Force Academy [in] Colorado Springs on exactly this? So I give a talk, and I point out a number of dimensions, and in front of me are some fairly high ranking officers and a number of cadets, and one of them stretches his hand and says, "Yes, yes, but Professor Galtung, if we should have only short distance weapons, how can we defend our economic interests abroad?" So one of the generals says, "Jesus, Galtung is going to make use of this," which is what I am hereby doing. And I, of course, said that, "Look, if your economic interests abroad are of such a kind that you have to defend them, maybe there's something wrong about them." So we'll come to that under economic power. In other words, there is a strong linkage, of course, between having long distance weapons and having such economic interests. You see, we are dealing here, then, with sensitive matters, and I ask myself the question: why has this category of military thought not entered the U.S. public discourse? Well, there are some answers to it, and one answer is fairly simple: because the United States has traditionally had four defensive defense weapons: the Atlantic Ocean, the Pacific Ocean, pacified Canada, and pacified Mexico. The pacifying mechanism for Canada is, to some extent, economic penetration. It's also a very strong sense of community based on a shared Anglo-Saxon myth. The pacifying mechanism for Mexico was to take half the country away from them, and, today, do a couple of other things, where among them the debt burden is one. There is also the shared myth of North America. In other words, one can say that the option of a non-offensive defense has not existed because there was no threat - no real, credible threat. Since 1812, as far as I know, the only weapon that really struck the United States was a balloon sent from Japan that landed not too far from this place and damaged a picnic party. Now that's a relatively light type of offense committed in a country, and the level of training that the United States has in receiving that kind of offense is equal to nil. Now, for those of us who have different experiences, the problem of not to provoke the other side becomes a basic problem. Why, now, did [the] Soviet Union change its discourse on this point? I think there are many reasons for it. The very basic one is simply this: the Soviet Union has twelve neighbors - geographical neighbors - from North Korea to Norway. It has two more that are so close that it can be counted in just a handful of miles: Japan - the distance from the four South Korean islands to Honshu - excuse me - to Hokkaido is a very small one, and [the] United States in [the] Bering Strait - it's a question of very few miles. The Soviet Union has been living, for centuries, and more recently for decades, surrounded by fearful, anxious, nervous people - nations that are afraid of the Soviet power for good reasons, given the invasions, for instance, in '56, '68, and '79 - and for that reason forces the Soviet Union to think one simple thought that was very basic when Gorbachev finally came out with his famous Pravda article in September, '86. We cannot afford to live with neighbors that are afraid of us. How can we make them less frightened? Well, one way of doing that is to cut down on your offensive repertory. The U.S. has not been in that situation recently, and that, of course, has served, in a sense, to blind and to dampen - even to paralyze - those cells in the brain that, in other peoples, are used for thinking non-offensive thoughts. The question is, then, of course, how those cells can be stimulated again. One way in which it happens, but it comes very slowly, is in debates with the Russians. I've seen Americans in those debates taken by utter surprise at being confronted with a paradigm, a discourse, totally alien to them. Now, the moment that is done, it becomes evident to you that an atomic mine, a nuclear mine, that is dug down in your own territory and detonates the moment the enemy is on top of it, is not an offensive weapon. It's not a good defensive weapon either because it destroys by far too much. Shall I tell you what it is? It is an intellectual mistake. It is simply a result of dumbness. Now when that dumbness is corrected and those mines are withdrawn, it is called disarmament, and the U.S. peace movement is not calling the bluff. In the same vein, I would say that conventional weapons, with long distance weapon carriers, are now so far beyond what we know from the Second World War that to express great relief when the threshold from nuclear to conventional is crossed in the potentially right direction also is misleading. It's to get it down to the non-provocative level which is important. What we are experiencing in Europe now, West and East, because this also applies to the Jaruzelski doctrine. It applies to Hungarian thinking, and it has for a long time applied to a pariah country in Europe, which should be, for domestic reasons, referred to as a pariah country - I'm thinking of Romania - but which in foreign affairs has had some extremely good ideas. What now happens is an interesting dialogue between peace researchers and security researchers, peace movement and military, about how we can constitute a defense that is non-provocative. So all I am saying, at this point, is there [are] a lot of fascinating thing[s] going on. You won't find anything of this reflected in the presidential debates - not a word, not an iota. Let us move on to structural violence and economic power. From a peace research point of view, structural violence is important for two reasons: one, because it can lead to direct violence, and secondly, because it kills, it hurts, it maims in its own right. I find very cynical the people who complain about economic injustice, exploitation, hunger, misery, starvation, about the 40 million children who are dying around the world - 40 thousand per day - not because this is bad in itself, [but] because it might one day lead to unrest. That's cynical. Both aspects are important. The question is, however, how do we go about thinking about it? We know empirically that where there is economic exploitation, sooner or later some kind of uprising takes place. Today, the weak may be so weak that their only weapon is terrorism, and the strong may prefer to respond in terms of state terrorism. Other days, it might be open war, it might be revolt, might be revolutions. So we are dealing with very forceful phenomena. The question is to understand them. So let me say some words about the key concept here, which is exploitation. I define exploitation, not as unequal exchange - I think that we will have very often in the world - but it is an exchange so unequal that the party at the bottom dies from it, or, to put it a little bit more technically, is unable to reproduce. Exploiting nature means depriving nature of its own reproduction capability. When people in the third world economically related to us have a life expectancy half of ours, then we are in fact killing every second one. But I can only say that if, at the same time, I can show that when this relationship is upset, when that third world country becomes economically independent, then the life expectancy shoots up. What happens when third world countries become socialist is that infant mortality improves almost immediately. Life expectancy goes through a period of improvement, and then that slackens off because there are other aspects to the story. Nobody should say that global exploitation is the only cause of misery; it's one among many. But again, then, what is the nature of exploitation? How does it happen? How does this inequality become dangerous? To explore that, just for a second, I would like to make use of a totally different example. Not Western Europe in Africa, Japan in Southeast Asia, or [the] United States in South America, but I would like to make use of the example of Japan in the United States. And the thesis is simply this: that what Japan is doing to the United States today is to engage the U.S. in a pattern of exploitation, with Japan at the top, so deep that a very reasonable prediction is that well before the year 2000, this could result in explosions. There could be minor explosions such as bombs on the Japanese-owned factories, and there could be major explosions. How is this happening? Well, at the surface of it, the first thing you notice is that Japan is exporting extremely sophisticated goods to the U.S.: automotive, machine tools, and computers, not to mention the small, delicate, difficult parts inside computers because Japanese workmanship is much higher and the products are at lower prices. Whereas what comes out of New Harbor to Tokyo, as Jimmy Wright pointed out a couple of years ago in his response to Reagan's address: scrap iron, waste paper. There are some soy beans, some lumber, agricultural products - things at a very low level of sophistication. Japan has managed to get on top of the U.S. in division of labor. It's been there for a long time. I think most Americans today have more or less gotten used to the idea that if you want a complicated product, don't look for "Made in U.S.A."
If you go inside an apartment in Manhattan - middle class apartment - some people have quantified it and found that 60 percent of the value of what is inside is made abroad. Now, that doesn't mean that nothing is made in the U.S. The bed is made in the U.S. The kitchen table is made in the U.S. The sink, maybe. The fridge, not so sure - maybe the outside, but not the inside. If you now continue that one, you find Japan exporting pollution to this country. You find Japan picking up cheap labor in this country, settling in the places in this country that are depressed or pre-depressed - between the Great Lakes and the Gulf. You find Japan exporting retired people to this country, and you find, of course, Japan gradually getting a very interesting type of political power. Now, the interesting thing about that is that Japan is doing here, not necessarily anything premeditated, but it just is in the logic of the structure, and it's doing exactly what we in the so-called "first-world" have been doing to the third-world all the time. Now our experience is that that creates just the opposite of peaceful relations, and potentially it may create not only unemployment, but things that may be more harmful to the style of life in this country. I know what I would be arguing if I were a U.S. politician. I would be arguing selective investment stop, selective import stop, and I would be arguing reindustrialization of the U.S. I would also like to ask those people who thought that the post-industrial society was such a bright job to come up and defend that thesis, because they made two very basic mistakes: number one, they thought that [the] U.S. would always retain supremacy in services, even if it gave up manufacturing voluntarily to others. And, number two, they thought that if it didn't necessarily work out, the position in manufacturing could be regained. Now, to reindustrialize is not that easy, among other reasons, because the U.S. working class has become deskilled, and, I think, also because engineers have a much-too-low position in U.S. corporations that are run by the money man and the legal man and gain more money through speculation than through production - the military sector being a combination of speculation and production. I also think that in the service sector it has been proven rather convincingly that Japan has been able to beat [the] U.S. also there. The leading firm on [the] New York Stock Exchange is not an American firm, but Nomura, and when the Nomura President was interviewed on U.S. television [and asked] how they managed to get there, he said, in a not very rich English vocabulary, "Working hard." And he was then asked, "What are you going to do now that you are number one?" He said, "Working harder." There is a message in that. But the point I am driving at is this: In this type of world, where the U.S. voluntarily or not voluntarily gave up its self-reliance in the manufacturing sector to such a large extent, hoping that it would keep supremacy in the tertiary sector, it's losing on both fronts. Why do I go into this long excursion? It's because I'm interested in the concept of exploitation. And I see a basic aspect of exploitation to be, if you will, the head and the brain of the other guy, and that the fight against exploitation consists in retaining your control, your capacity to produce and reproduce - in other words, self-reliance. If you now go from these general things to three parts of the world that, to me, constitute relatively good examples of peace areas, you can see how another economic system works. So, the three that I find positive are the European community countries among themselves, the ASEAN Association of Southeast Asian Nations among themselves, and the Nordic countries. It's not possible for the Nordic Finance Minister or Minister of Trade to strike a deal with the Swedish Minister of Trade that pollutes Sweden, but not Norway. It simply doesn't work. It would have worked if Sweden were located in Malaysia, and the Norwegian Trade Minister has struck that deal. So, what's the real difference? The difference is not only that Sweden is stronger than Malaysia. The difference is that we belong to the same family. I could say that in the contractual approach that dominates economic theory, there is one big advantage, and that is the implicit solution to Gorbachev's problem: how do you relate to other countries without showing force and invading them? Answer: you trade with them. Capitalism is fantastic at that. But then comes the weakness: you might trade the other guy into submissiveness. You might exploit him through your trade pattern. Like I say, Japan is exploiting [the] United States, and [the] United States lets itself be exploited by foregoing the externalities of having to work out those marvelous Japanese products themselves. The easy way to get it is to get it from somebody else instead of making it yourself. Now, that doesn't mean that the U.S. engineers don't know how to make it. It's only that they don't know how to make it at a competitive price and so that it lasts. It has a tendency to go to pieces when "Made in U.S." is stamped on it. It makes a difference. And all the data for this exists. All the comparisons of the cars exist. All of that is well-known. Let me be more specific. Yesterday morning, the trade deficit figures became known; they had gone up. Deficit in trade, in visible goods, is a very small and very insignificant part. Much more important when it comes to constituting exploitation is where you stand in the division of labor. I would say that if the United States becomes a country only capable of hoisting upon others tobacco, alcohol, Kentucky Fried Chicken, McDonald's, a little bit of agricultural products, waste paper, and scrap iron, if that country were able to run a trade surplus on such products, the situation would be disastrous. Since the level of degree of processing is not the level at which these statistics work, the discourse conceals the problem. So what, then, would be a better discourse? Well, here we are in a different situation from the military one. I think we are further away from a solution than in the military case. We have a lot of literature today and a lot of thinking about non-provocative defense. We also have a lot of literature about alternative economics - about alternatives to a very pernicious trade theory called "comparative advantages," which is a recipe for keeping countries where they are. The countries that are low should stay there. The countries that are high can keep on there. So why, then, couldn't we just have that "new literature," so to speak, penetrate and take over from the old? No, because the old is protected, well encrusted in formidable mathematical theories, protected by the language of high priests, and very, very difficult to attack. I can say, having some experience from the last thirty years in this, that I, in general, find it much more easy to talk with military people than with professors of economics. I find it also much more easy to talk with businessmen than with professors of economics. Now, if you ask me would I like my daughter to marry a professor of economics, then the answer is no, but since my daughter is only eleven years old and I am optimistic, I think there will be changes also in those quarters, so I would not rule it out for the future. Third and last part: cultural violence, the domain of culture. We are here in a very, very sensitive spot. And I was talking about chosen people, so let me give you a list of chosen peoples, and it comes from something I've been working on for some time: "comparative chosen people-ology." And let me just say immediately that there is no doubt that Norwegians are chosen, but the problem about our chosenness is that nobody else knows about it and we have no scripture that is written in any kind of legible print. There are some indications in the Nordic sagas that we were closer to Oden than most others. You can also look at the map and you will find our country on top, which should indicate a certain geographical proximity to higher forces. But this is usually not considered sufficient. Much of the debate between Dukakis and Bush is about this. The two critical words in the Pledge of Allegiance are the two last words: "under God." Should they be said? Should they not be said? Whispered? Not whispered? Murmured? Not murmured? My daughter tells me that at her school they have a way of moving the lips without saying anything, which seems to be used in quite many places. There are other places in the U.S. where the words are spoken out quite loud. Now, I have understood that "under God," in that case, means directly under God. It means, in fact, so close that there is space for absolutely nothing in between. For instance, one thing that cannot be between is [the] United Nations. Now, [the] United Nations is a peace utopia for many of us. I would see it as a way of spelling out, at a world level, some of the fortunate aspects of the European community, ASEAN, and the Nordic community. Look at the way in which one of the presidential candidates uses this. He doesn't refer to his opponent by name; he calls him "he." "‘He' says that [the] United States is located somewhere on the U.N. role call between Albania and Zimbabwe." Now, this is brilliant rhetoric. I mean, I don't like it, but I just admire the rhetoric of it. "Whereas I," he says, "see [the] United States as an exceptional country given a certain mission in the world" and so on. So that's a strong one. There are more. England was one. Germany was one. The Boers in South Africa were selected by God as a bastion for Christianity. The French are among them, but a somewhat special case, because the French would not see themselves as selected by God - that would be an indication that there was something above the French. They would rather see themselves as un peuple élu, choisi par eux-mêmes - a chosen people chosen by themselves - which Napoleon illustrated brilliantly in 1804 when he was to be crowned by the Pope and took the crown from the Pope and put it on his own head. That's French. I can only say that, in a sense, I'm happy the country has only 55, and not 245 or 280, million inhabitants. Russia is chosen as the carrier of the only true Christianity. Now, what happened to that under communism? Well, it was chosen as the carrier of the only true communism or socialism, and they had one person who had spent six years of his life in an Orthodox Christian seminary, Ioseb Jughashvili - Stalin - who carried out the theological exercises of translating Orthodox Christianity to Orthodox Marxism. And it worked; it stuck for a long period. Of course, being officially atheist, they don't see themselves as being chosen by God, but chosen by "History," with a capital H.
I think Michael Dukakis stands for very much the same. The U.S. is exceptional; it's number one in the world; it should be a beacon to all of humanity; it's only that all those other guys have betrayed it. And that's where Bush differs from him. To the contrary, we didn't betray it; we were the ones who did it; it's you guys who have betrayed it. Well, he will have the kind of stuff out of which legitimacy is worked. Because when one starts thinking like that, then of course the idea comes that one is entitled to structural violence and one is entitled to make use of direct violence. But what when that structural violence is used against oneself, as my argument about Japan and the U.S. is? Well, that is where the U.S. political discourse breaks down completely, because: A] the instrument for understanding what goes on has to make use of the word or something corresponding to exploitation; B] that has a touch of Marxism - maybe only five percent, but that's exactly five percent too much; C] if the U.S. should see itself as exploited by Japan, and not only having a trade deficit, which is a trifle, then [it] might be [that] it would have to see that the U.S. itself is doing the same to other countries. In other words, to see what happens to oneself might be a guide to opening one's eyes to what one does to others. So I see that as a stopper for the creation of an adequate political discourse. The more the U.S. discourse is blinded by some kind of fear of reality, the more business will the Japanese be able to do, not in, but with and on, the U.S.
How could a country which is selected by God as a chosen country see itself as inferior except in trifles, such as trade deficits? The only way it could see itself in that light would be by accepting the idea that God no longer loves us. Now, for that idea to take root, you might have to go into the idea that God has reasons, but those reasons, as picked up by the right wing of this country, are in model terms, and they are very, very often, as we know, in sexual terms, and very often spoken of very loudly by people who seem to experts in such matters. Now, I'm now coming to the end. We have a web of three extremely complicated factors. Direct violence is difficult enough, and I've indicated that a change towards non-provocative defense, a withdrawal of the offensive tentacles, a sort of porcupine, rather than a serpent, or bear-like, or bald eagle-type defense, might be very useful. I'm not saying it's perfect. A really good world would have total disarmament in it, but that world, it's not so absolutely definite that it'll come before [the] year 2000. I've indicated that in the military doctrine there is a movement going on, and the debate has had a shift during the last 10 years, which is phenomenal, and I have courteously said, everywhere except in this country. That doesn't mean that you don't have institutes in this country discussing defensive defense, but it's always defensive defense in Europe. Now the interesting thing is what would non-provocative defense look like in this country? What would be the conversion formulas in this country? I love the idea of converting to the civilian sector, but I also think this kind of thinking is necessary. So here I've indicated that there is movement. I've also said that in the economic field, there are lots of ideas, but there is less movement because of an "encrusted," if you will, discourse, well-protected, among other things, by a deductive system, and even in mathematical form. But underneath all of this is the toughest one of them all, and that's cultural violence, because that has to do with our whole identity. Take the chosenness away from an average chosen person, and you take his happiness away at the same time, to paraphrase Ipsen. I won't even pretend that we know the answer to that one. If a chosen people could be put on the couch and a socio-analyst could ask the chosen people, "Now please tell me how come this idea that you think you are chosen? Just go back to your infancy. Tell me, what kind of fantasies did you have? When you were reared by some other nation - did you get it from the British, by chance? How was it? Just get through, and now if you want to hit me when doing it, here's my hand. Just hit. Bite." Well, chosen peoples have a tendency not to get down on that couch. Chosen peoples also have a tendency to be beaten sooner or later, and in very vicious ways. Some of them can take it with grace. I have always argued that the British should send people around the world how to take it with grace. Margaret Thatcher would not be among them because she has a sort of, if you will, resilience, recalcitrance, and a kind of residual chosen people-ness, which is to be expected. All kinds of diseases always come up sooner or later again in some other form. However, given this kind of general setting, what we need very, very basically in peace studies is a theory of how to diminish cultural violence. We see it at work many places in the world. South Africa is one. The Middle East is another. Residual Pax Americana is a third. Residual Pax Sovietica is a fourth. And the fifth one is the small family of cultural violence, the Pax Nipponica. Being chosen by the sun goddess, with a [tenor?] who is now dying, and whose death is processed as raw material to a higher level of state Shintoism than ever since 1945 is a miserable sight indeed. You will understand from this that a declining chosen America, wedded in a pattern of exploitation to a chosen Japan on the increase on the other side of the Pacific, is not exactly a formula for peace. It is just the opposite. Because it is just the opposite, I think attention should be given to it, and it should be nipped in the bud. Is the U.S. political discourse adequate to the task of peace? Answer: no, A] because of inability to confront the third possibility of non-provocative defense, B] because of inability to deal seriously with economic exploitation and its alternative, egalitarian relationships, and C] because of inability to see its own exceptionalism as problematic.